The artist; purchased 18 May 2001 through (PaceWildenstein, New York) by NGA. Robert Ryman, Stedelijk Museum, Amsterdam, 1974, no. 16. Robert Ryman, Whitechapel Art Gallery, London, 1977, no. 18. La Biennale di Venezia. Art in the Seventies, Venice, 1980, no. 1 of three works in catalogue by Ryman. Robert Ryman: Peintures, 1958-1991, Renn, Espace d'art Contemporain, Paris, 1991-1992. De Opening, J.H. De Pont Foundation, Tilburg, The Netherlands, 1992-1993, no. 49, repro. Peinture. Emblèmes et Références, C.A.P.C., Musée d'art contemporain, Bordeaux, 1993-1994, unnumbered catalogue, repro. Long-term loan, Halle für Neue Kunst, Schaffhausen, Switzerland, until 2001. Frey, Patrick. 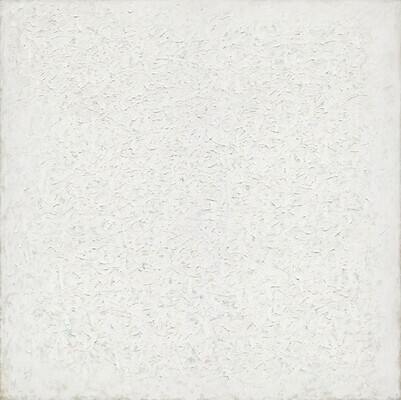 "The American Robert Ryman at InK: White - An Empire of Colours." In Tages-Anzeiger, Zurich, 1980, reprinted in Dokumentation 6 (Ausstellungen im InK), Zurich, 1980: 5-6. Gilbert-Rolfe, Jeremy. "Appreciating Ryman." Arts Magazine 50, no. 4 (December 1975), reprinted in Immanence and Contradiction, New York, 1975: 72-73. Buren, Daniel. "Ryman: la resistance de l'invisible." Beaux Arts Magazine, no. 185 (October 1999): 54-61. Raussmüller, Urs, Christel Sauer, Daniel Buren, and Alfred Pacquement. "Robert Ryman." Les Hors-Série de Beaux Arts Magazine, 1999. Sauer, Christel. "A propos de Robert Ryman." Beaux Arts Magazine, no. 185 (October 1999). Weiss, Jeffrey. "Robert Ryman: Untitled, 1961, and Untitled, 1965-1966." National Gallery of Art Bulletin 26 (Fall 2001): 10-11. Humblet, Claudine. La Nouvelle Abstraction Americaine 1950-1970. 3 vols. Milan and Paris, 2003: 2:1281. Hand, John Oliver. National Gallery of Art: Master Paintings from the Collection. Washington and New York, 2004: 459, no. 388, color repro.